We have counselling rooms in the following locations across the North West. All appointments are made through our Liverpool office on 0151 737 2121. Please contact us should you need any help to decide which venue is most appropriate. Please note that Southport is not currently available. Married couples counselling only takes place in Liverpool, Manchester, Chester, West Kirby and Sheffield. Children and young people counselling only takes place in Liverpool and Chester. Please click on each venue below for a Google Map, our Map and our Directions. Bus no. 86, 86 A + 86 D : Liverpool One Bus Station stand 9, Hanover Street or Elliott Street. On Allerton Road, alight at the second bus stop after Queens drive. There is a roundabout and a set of traffic lights at this junction. The HSBC bank is on the corner on the left. The second bus stop is just after Costa Coffee. Walk back to Reach (about 125 metres) Please note: some buses don’t stop at Costa but continue round the corner to the next bus stop in Green Lane. Bus no. 86 C : Liverpool One Bus Station stand 9, Hanover Street or Elliott Street. This bus goes to Menlove Avenue. Alight at the corner of Addingham Road (second bus stop on Menlove Avenue). Cross the road and walk down Addingham Road to the corner of Allerton Road. next door to the Ladbrokes Betting Shop. 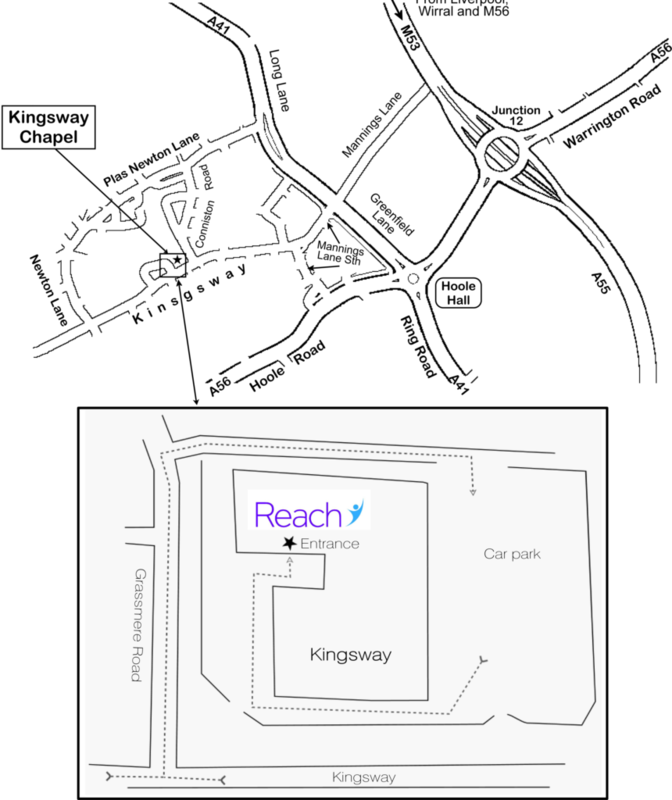 Our entrance is between Auberge cafe and Ladbrokes. Iceland is situated almost opposite across Allerton Road. Bus no. 61: via Walton Vale, Broadway Old Swan and Childwall to Allerton Road. Bus no. 81: via Walton, along Queens Drive. Alight at Childwall Fiveways, by Nat West Bank. At the Liverpool end of the M62, take the slip road left and follow signs for Garston and the Airport. (Childwall Fiveways) where you take the third exit. Continue through another set of lights to the next roundabout. Take the second exit here and move straight away into the inside lane to turn left into Allerton Road at the traffic lights. 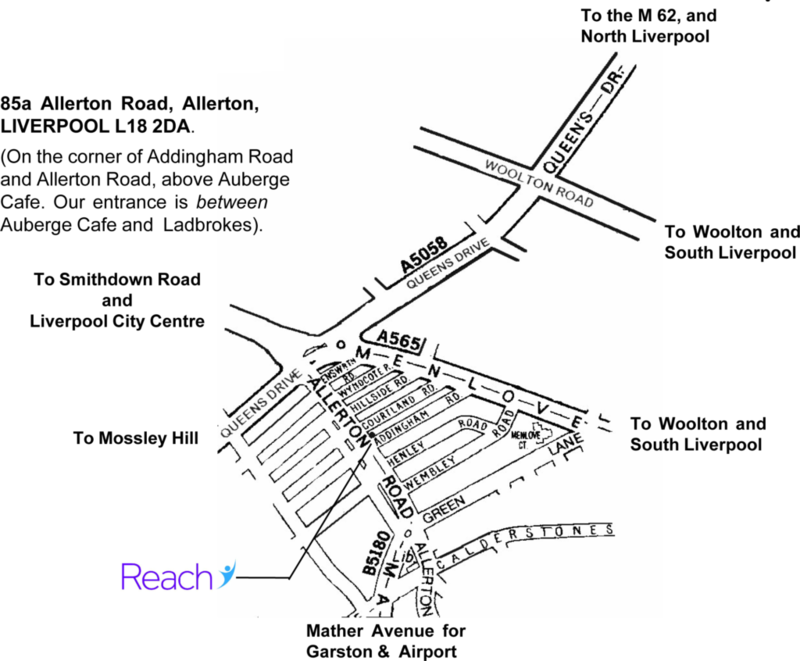 Reach is at the end of the fourth block of shops on the left, on the corner of Addingham Road, above the Auberge Cafe. As Addingham Road is ‘No Entry’ at this point, you would be advised to turn into Courtland or Henley Road to park. 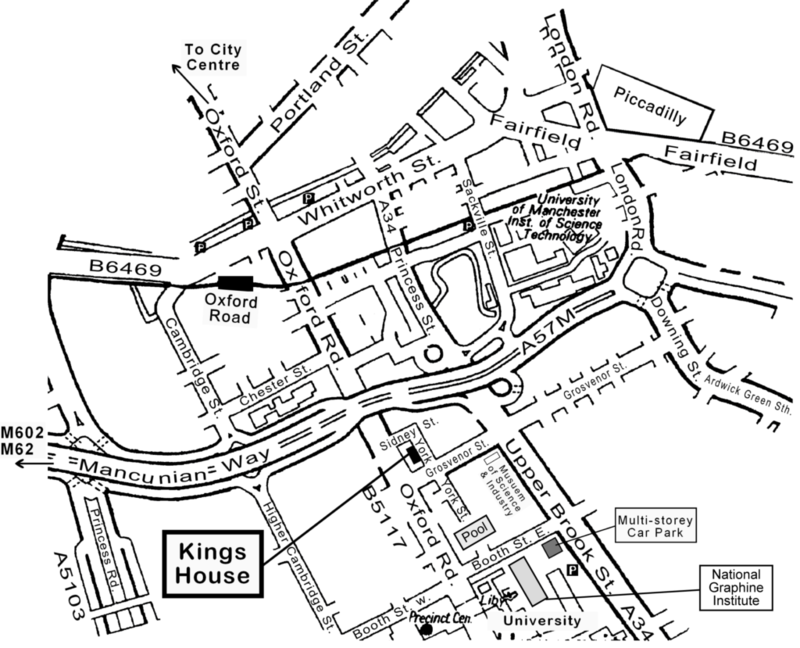 If you are coming along Grosvenor Street, go to the lights at Oxford Road and turn right by Barclays Bank. (This is because York Street is one way.) Take the first right again at the next set of lights onto Sidney street. Follow Sidney Street round, which then becomes York Street. Kings House is then on your right. Every 15 minutes. The journey takes approximately 10 – 12 minutes. Sorry Southport is not currently available. Come off the M53 at Junction 1. From the tunnel take the third exit; from Ellesmere Port take the first exit left, marked ‘To Wallasey’ A554. Follow the signs for A554. Eventually, Turn right onto Kings parade A554, following the sea wall. Go straight ahead at the next two roundabouts, passing three sets of high rise flats on your right. At the next roundabout turn right, up the hill into Rowson Street A554, marked on your map. 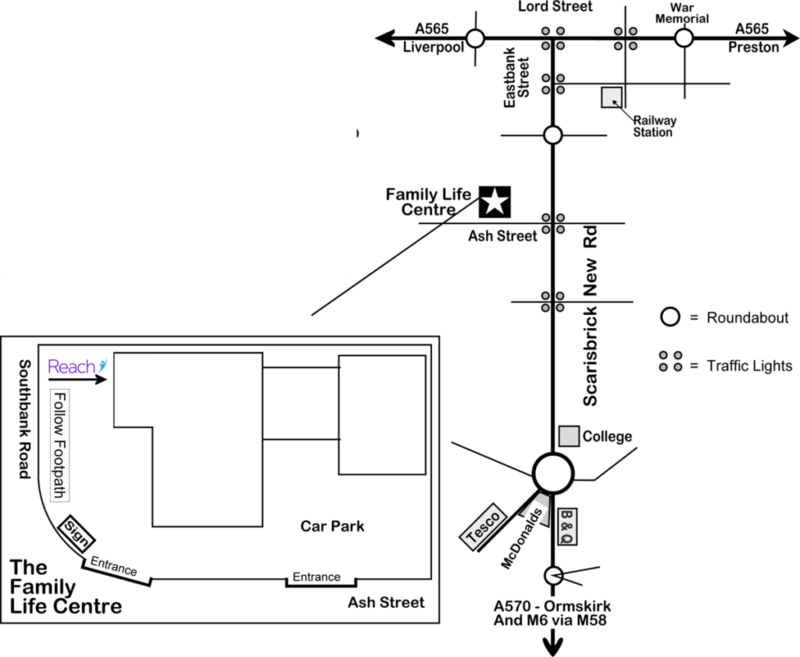 Following the map, continue down Rowson street onto Seabank Road A554 to New Brighton Baptist Church. No 401 – From Birkenhead: To New Brighton, NOT 401 Chester. Ask to be put off at Seabank Rd Post Office/Baptist Church. New Brighton Baptist Church is adjacent to the bus stop. Bus leaves the station on the hour and half hour. No 410 – From Birkenhead: To New Brighton, NOT 410 Clatterbridge. Get off at Marsden Court, Rake Lane. Cross over road and go down Sandfield Rd to the bottom, turn right, you should see New Brighton Baptist Church. Bus leaves the station every 15 minutes. Ask to be put off at Seabank Rd Post Office/Baptist Church. New Brighton Baptist Church is adjacent to the bus stop. Buses run every 20 minutes. 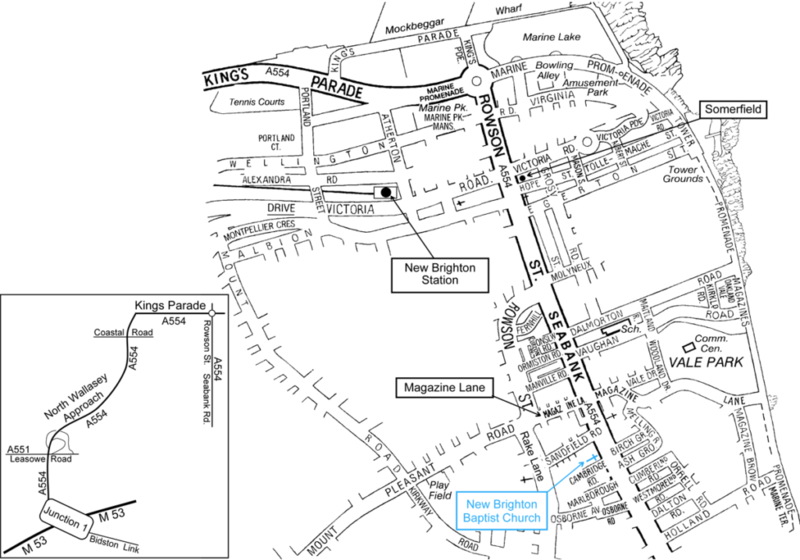 New Brighton Station is marked on the map and is about a 15 minute walk. Come out of the station and turn left into Victoria Road. Walk along to the traffic lights and then turn right into Rowson Street. Walk up the hill past the shops and keep going until you reach New Brighton Baptist Church. West Kirby URC is the red-brick church situated at the corner of Meols Drive and Bridge Road, near Aldi. 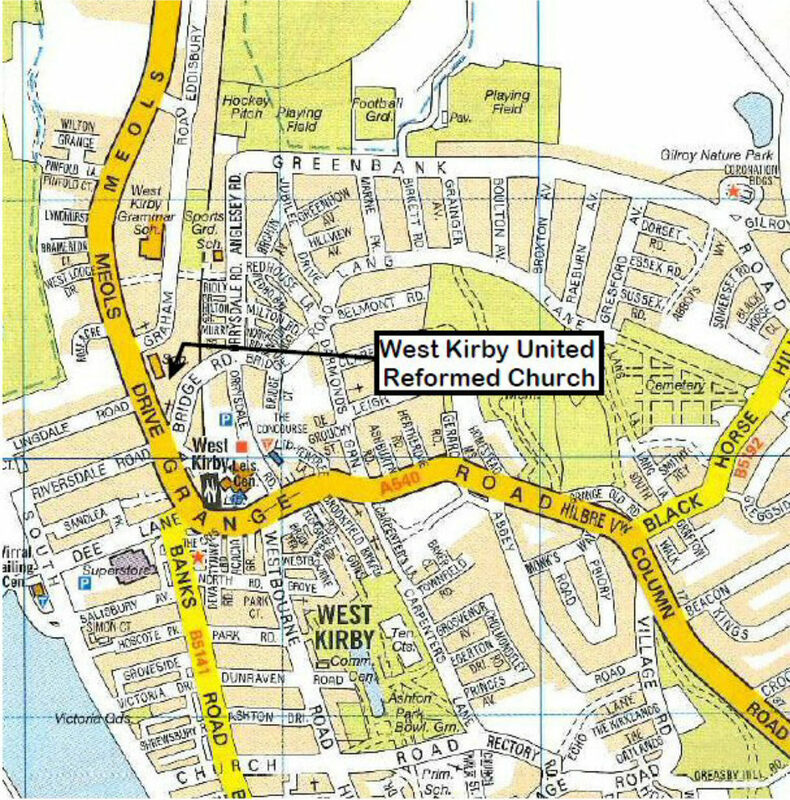 A number of buses stop immediately opposite the church, and West Kirby’s main bus stops and train station are a few minutes’ walk away. The entrance for the 1st Floor Counselling Room is via St Thomas Philadelphia’s reception on the corner of Gilpin Street and Cross Gilpin Street. Please press the buzzer for access and you will be met at the top of the stairs. St Thomas’ Church Philadelphia is located between the A61 Penistone Road and Infirmary Road. Coming from the Shalesmoor roundabout, take the first left after the petrol station. From the city centre or train station you can get a tram to either Malin Bridge or Middlewood. Get off at the Infirmary Road stop and St Thomas is on the road on right.